Rockstar Energy Suzuki Europe drew its international racing season to a close at the Grand Prix of Benelux for the final meeting of the FIM Motocross World Championship today as Jeremy Seewer finished the eight round European EMX250 series with a well-earned second place overall despite some bad luck in the Lierop sand and a result outside of the top 20. Max Anstie was unable to finish either MX2 moto while Brian Hsu posted a reasonable eighth place finish in the last outing for the European EMX125 competition. Lierop initially seemed to hold some promise for Anstie in the MX2 class and on the works RM-Z250: The Brit had scored a podium finish in the rough and strength-sapping sand in 2012 and was keen to end a mediocre Grand Prix term with a flurry. Sadly the 20 year old's attempt was nullified by a relatively small crash in the first moto. The accident scraped a layer of skin away from his gouged left elbow, injured at the Grand Prix of Czech Republic last month and he had to retire and seek treatment on the irritated wound. Patched-up for the second outing Anstie was working into a top-10 position around the lumps, berms and ruts when a mechanical issue curtailed his progress. 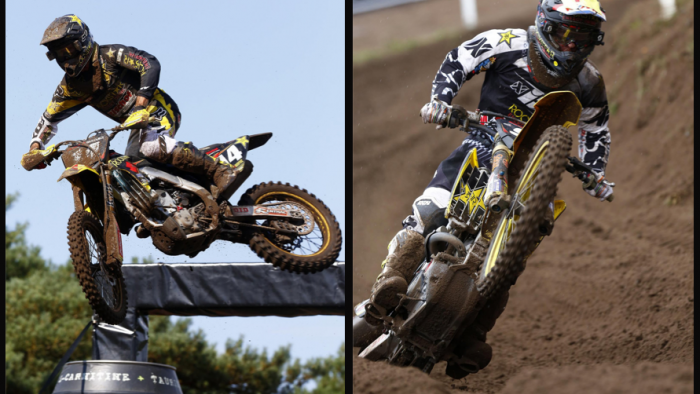 Anstie ends 2013 10th in the MX2 standings and now looks to the two final races in the ADAC MX Masters series to finish off his duties with the Rockstar Energy Suzuki Europe squad. Seewer was just as unfortunate: A crash and loss of time and positions in the sand during his crucial EMX250 Final proved hugely costly to the talented Swiss. He managed to roll over the line in 22nd position but without points and with his worst finish in what was otherwise a stellar campaign with two wins and six podiums. In the same heat Jorge Zaragoza failed to make the chequered flag after a crash left him dazed and disorientated. Brian Hsu was eighth in the EMX125 category and squared-away the same slot in the championship table in his first season on the RM125. Supported by ADAC in his efforts, Hsu will be back for another term in 2014 and will look back on his podium result at Bastogne, Belgium as a superb highlight of the year. With the team turning its attention to domestic duties on German soil, the spotlight is not quite drifting away from Seewer as the 20 year old will line-up for Team Switzerland at the 67th Motocross of Nations at Teutschenthal at the end of the month. "Not the best way to end the season. You know there is not one thing I would change about this season. Between myself, Jens and Kevin, we worked as hard as we possibly could from the day after the 2012 Motocross of Nations to now. We did everything we could and it is shame things haven't worked out and we have been on the back foot with a few things. I've learnt a lot and I keep on pushing. Today was a bit of a bummer with the way the second race went. I just want to look into the future now. I will get my arm checked out and then head to Germany for our last races this season." MX2 Moto1: 1. Jeffrey Herlings (NED, KTM), 41:24.973; 2. Dylan Ferrandis (FRA, Kawasaki), +0:24.222; 3. Jordi Tixier (FRA, KTM), +0:32.428; 4. Petar Petrov (BUL, Yamaha), +1:00.651; 5. Dean Ferris (AUS, Yamaha), +1:06.498; 6. Romain Febvre (FRA, KTM), +1:21.561; 7. Aleksandr Tonkov (RUS, Honda), +1:30.868; 8. Christophe Charlier (FRA, Yamaha), +2:22.185; 9. Kevin Fors (BEL, Yamaha), -1 lap(s); 10. Pascal Rauchenecker (AUT, KTM), -1 lap(s); 25. Max Anstie (GBR, Rockstar Energy Suzuki Europe), -8 lap(s). MX2 Moto2: 1. Jeffrey Herlings (NED, KTM), 41:23.154; 2. Glenn Coldenhoff (NED, KTM), +0:07.674; 3. Dylan Ferrandis (FRA, Kawasaki), +1:14.662; 4. Jordi Tixier (FRA, KTM), +1:20.629; 5. Petar Petrov (BUL, Yamaha), +1:26.798; 6. Arnaud Tonus (SUI, Kawasaki), +1:30.189; 7. Romain Febvre (FRA, KTM), +1:39.988; 8. Dean Ferris (AUS, Yamaha), +1:42.255; 9. Maxime Desprey (FRA, Yamaha), +1:49.656; 10. Alessandro Lupino (ITA, Kawasaki), +1:56.247; 26. Max Anstie (GBR, Rockstar Energy Suzuki Europe), -10 lap(s). MX2 Overall result: 1. Jeffrey Herlings (NED, KTM), 50 points; 2. Dylan Ferrandis (FRA, KAW), 42 p.; 3. Jordi Tixier (FRA, KTM), 38 p.; 4. Petar Petrov (BUL, YAM), 34 p.; 5. Romain Febvre (FRA, KTM), 29 p.; 6. Dean Ferris (AUS, YAM), 29 p.; 7. Christophe Charlier (FRA, YAM), 23 p.; 8. Aleksandr Tonkov (RUS, HON), 23 p.; 9. Glenn Coldenhoff (NED, KTM), 22 p.; 10. Jake Nicholls (GBR, KTM), 17 p.; 27. Max Anstie (GBR, Rockstar Energy Suzuki Europe), 0 p.
MX2 Final World Championship Standings: 1. Jeffrey Herlings (NED, KTM), 742 points; 2. Jordi Tixier (FRA, KTM), 607 p.; 3. Jose Butron (ESP, KTM), 518 p.; 4. Christophe Charlier (FRA, YAM), 490 p. 5. Glenn Coldenhoff (NED, KTM), 472 p.; 6. Dean Ferris (AUS, YAM), 463 p.; 7. Jake Nicholls (GBR, KTM), 424 p.; 8. Alessandro Lupino (ITA, KAW), 330 p.; 9. Dylan Ferrandis (FRA, KAW), 329 p.; 10. Max Anstie (GBR, Rockstar Energy Suzuki Europe), 320 p.
European EMX250 result: 1. Valentin Guillod (SUI, KTM), 32:31.418; 2. Mike Kras (NED, Suzuki), +0:15.392; 3. Brian Bogers (NED, KTM), +0:31.622; 4. Pauls Jonass (LAT, KTM), +0:32.463; 5. Nick Kouwenberg (NED, Yamaha), +1:00.907; 6. Rene Albers (NED, KTM), +1:55.864; 7. Micha-Boy De Waal (NED, KTM), +1:57.578; 8. Luca Nijenhuis (NED, Kawasaki), +2:04.246; 9. Roel Van Oort (NED, Yamaha), +2:10.043; 10. Sven Van Der Mierden (NED, Yamaha), +2:27.558; 22. Jeremy Seewer (SUI, Rockstar Energy Suzuki Europe), -1 lap(s); 33. Jorge Zaragoza (ESP, Rockstar Energy Suzuki Europe), -5 lap(s). European EMX250 Final Championship Standings: 1. Valentin Guillod (SUI, KTM), 189 points; 2. Jeremy Seewer (SUI, Rockstar Energy Suzuki Europe), 152 p.; 3. Damon Graulus (BEL, KTM), 116 p.; 4. Brian Bogers (NED, KTM), 109 p.; 5. Mike Kras (NED, SUZ), 81 p.; 6. Ceriel Klein Kromhof (NED, KTM), 68 p.; 7. Micha-Boy De Waal (NED, KTM), 67 p.; 8. Thomas Kjer Olsen (DEN, HON), 60 p.; 9. Brent Van Doninck (BEL, KTM), 59 p.; 10. Benoit Paturel (FRA, HUS), 59 p.; 14. Jorge Zaragoza (ESP, Rockstar Energy Suzuki Europe), 34 p.
European EMX125 Final Championship Standings: 1. Pauls Jonass (LAT, KTM), 193 points; 2. Nicolas Dercourt (FRA, YAM), 168 p.; 3. Calvin Vlaanderen (NED, KTM), 152 p.; 4. Anton Lundgren (SWE, KTM), 150 p.; 5. Henry Jacobi (GER, KTM), 142 p.; 6. Frederik Van Der Vlist (NED, YAM), 137 p.; 7. Davy Pootjes (NED, KTM), 94 p.; 8. Brian Hsu (GER, Rockstar Energy Suzuki Europe), 73 p.; 9. Alvin Ostlund (SWE, YAM), 73 p.; 10. Kade Tinkler (CAN, SUZ), 72 p.